Since 2009, archaeologists have been slowly excavating the ancient town of Magdala—thought to be the home of Mary Magdalene—near the Sea of Galilee. 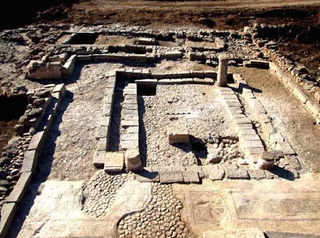 Among their finds has been a first-century synagogue where, experts say, Jesus likely preached. Although Jerusalem and Bethlehem are the sites most commonly associated with Jesus, Father Eamon Kelly—vice president of Israel's Magdala Center and vice chargé of the Pontifical Institute Notre Dame of Jerusalem Center—points out that Jesus spent almost his entire life in what is now northern Israel. "Eighty percent of Jesus' public life was here," he tells the Israeli newspaper Haaretz. Archaeologists believe the synagogue was built in 1 AD and then upgraded into a more ornate building in 40 AD. The Romans destroyed the synagogue in 67 or 68 AD, during the First Jewish Revolt. But significant parts of the structure remains intact, including ritual baths and a sculpted limestone block probably used for writing or reading the Torah. Its relief depicts the oldest menorah ever found on stone. Experts say it's highly likely that Jesus would have preached in the uncovered synagogue….Until Tiberias was built, the only town on the western shore of the Sea of Galilee was Magdala. Anyone touring the region, as Jesus did according to the New Testament, teaching and preaching in synagogues all through Galilee, would not have skipped Magdala, located on the Via Maris—the ancient trade route that ran along the Mediterranean and the western shore of the Sea of Galilee all the way from Egypt to Syria.